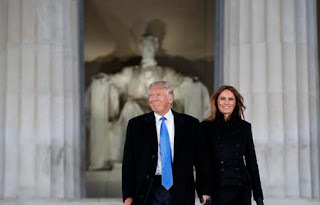 Washington - With his left hand on a Bible used by Abraham Lincoln, Donald Trump will be sworn in as the 45th U.S. president around noon on Friday (about 7pm in SA) and give an address at the west front of the U.S. Capitol before leading a parade to the White House. * Weather is forecast to be wet and unseasonably warm. The National Weather Service predicts temperatures nearing 47 degrees Fahrenheit (8 degrees Celsius) and rain tapering off by midafternoon. * After breakfast and a church service, Trump and his wife, Melania, will meet outgoing President Barack Obama and first lady Michelle Obama at the White House. Following tradition, Trump and Obama will ride together down Pennsylvania Avenue to the Capitol. * Supreme Court Justice Clarence Thomas will swear in Mike Pence as vice president. Chief Justice John Roberts will administer the oath of office to Trump. * Trump will give an inaugural address expected to last about 20 minutes. His spokesman Sean Spicer said Trump will give "a very forward-thinking, very inspiring, together-oriented speech" on solving such problems as creating jobs. * As many as 900 000 people are expected to turn out for the event, including thousands of protesters. After the ceremony, the Obamas will leave the Capitol to begin their post-White House lives. Trump and Pence stay for lunch. * Starting around 3pm, Trump, Pence and their families will lead a parade up Pennsylvania Avenue to the White House. Inaugural organizers expect more than 8 000 people to take part, including high school and university marching bands, equestrian corps and veterans groups. * Donald and Melania Trump may step out of their limousine briefly along the parade route to wave to well-wishers. Three inaugural balls are scheduled in the evening. * Following tradition, Obama will leave his successor a letter in the Oval Office desk. Its contents have not been divulged. * While 20 minutes may seem short for an inaugural address, it would not be the shortest. George Washington's second inaugural speech in 1793 consisted of about 130 words. * The honour of longest inaugural address goes to William Henry Harrison, whose March 4, 1841, speech contained more than 8,440 words and lasted an hour and 45 minutes. Harrison, who gave his speech in a howling snowstorm without a hat or a coat, died of pneumonia a month later.